The 39-times capped Welsh international has said he would be willing to play for Rangers in the Third Division. 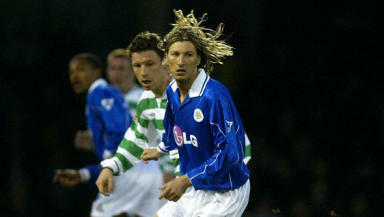 Former Wales international Robbie Savage has offered to come out of retirement to play for Rangers for free. The 37-year-old, who quit the game last summer after a spell with Derby County, has taken to Twitter to urge Ally McCoist to call him. Rangers will play in the Third Division this season, provided their holding company Sevco Scotland Limited gain the transfer of the club's membership from the Scottish FA. "If Rangers are struggling for players I would come out of retirement and play for nothing," he said on Twitter. "[I] could do a job in Scot Div 3. "It would be a privilege to play for a great club. [I] only retired a year ago, as fit now and would play for free. "I might be mad thinking I can, but if they are desperate for players , I'll go up there and play for nothing." Midfielder Savage started his career at Manchester United, leading on to spells with Crewe Alexandra, Leicester City, Birmingham City, Blackburn Rovers and latterly Derby. Known for his uncompromising style during his playing career, Savage was once the most booked player in England's top flight. Since his retirement, he has launched a successful media career and was also a contestant on Strictly Come Dancing. Former Hearts pair Craig Beattie and Ian Black are currently training with Ally McCoist's team, with the latter set to sign a three-year deal if and when the membership situation is resolved. Sevco are understood to have reached agreement with the Scottish FA over the acquisition of the membership. The league believes Rangers have a case to answer over allegations of paying players outside of their contracts for a period during the last decade. Possible sanctions if the SPL finds the club guilty include stripping titles won during that period, something Green is unwilling to accept.